Tried to use my Wii Fit + on Friday, but it said the batteries were low. Frustrating, as I’d just put new, rechargeable ones in. Followed the instructions for resetting and re-synching the handsets, only to have the same thing happen again. Gave up, but charged up the brand new, very expensive, rechargeable batteries. Had another go today, same thing, but I just wondered if it wasn’t the handset that had low batteries, maybe it was the thing you have to stand on. And guess what. It was. So all sorted out now, except that we don’t have anywhere nearly enough rechargeable batteries for all the different things we use – various remote controls, etc. So have spent another £28 and ordered 12 AAAs and 12 AAs, just to be sure. Hmph. Managed to use the Wii Fit + today, and in the process pulled a muscle in my right hip, so I’m limping around like an old biddy. Harrumph harrumph harrumph. Damn and blast. Painkillers, ice packs, I could spit I’m so cross with myself. Hubby says I’m a delicate little flower, and easily breakable. I think I’m just pathetic! Have heard from my lovely French friend. Her daughter died of pneumococcal meningitis, which strikes very swiftly and if it isn’t fatal, can easily cause permanent brain damage. Very rare apparently, and difficult to diagnose. Made bread rolls today – set the breadmaker up last night so that this morning when I got up it was just kneading the dough. They do turn out well, I will say, and we had one each for lunch. Have ordered some new clothes on line. One checked shirt from M&S, one empire line (I think) tunic from Wallis. I’ve ordered two of each, one in size 12, one in size 14, so that I can take back whichever doesn’t fit and only pay one lot of postage (to each store). But I’ll go into Solihull to take them back when they’ve all been delivered and then I can have a quick look round the other shops too. I do like jersey t-shirts, long or short sleeved, but am coming round to the opinion that they’re not very flattering when one is 56 and not terribly fit. Bulgy bits. Which I’m hoping will be camouflaged by different style/material. We’ll see. Watched “Coco before Chanel” on Thursday night – excellent – although it wouldn’t play on the very expensive Blu-ray player! which ejected it twice and then it was very jerky. Altered various settings, eventually gave up and got the old DVD player downstairs. Worked a treat . . . we definitely need a spare bog-standard DVD player available for such eventualities! Hubby has just sold his Linn CD player and amp thing on ebay. What a performance. Questions, questions, questions – I have no problem with questions about delivery costs etc, but when somebody asks you the same question over and over again, even when I’ve responded in their native language (luckily ones I do actually speak), I get a bit p***ed off. Ah well, done now. Just need to wait for payment and the courier to arrive to collect it. Making further resolutions in my head to lose some weight. Easter made it difficult to refuse the chocolate during the week, and my clothes still fit, but even the Wii Fit thinks I’m too fat. My BMI is 25, so not horrendously overweight, but I really must stop eating bowls of cereal at night. And I won’t order any chocolate for me next weekend, because we have some carrot cake in the freezer, so that will satisfy my sweet-toothed cravings. What have I been doing? 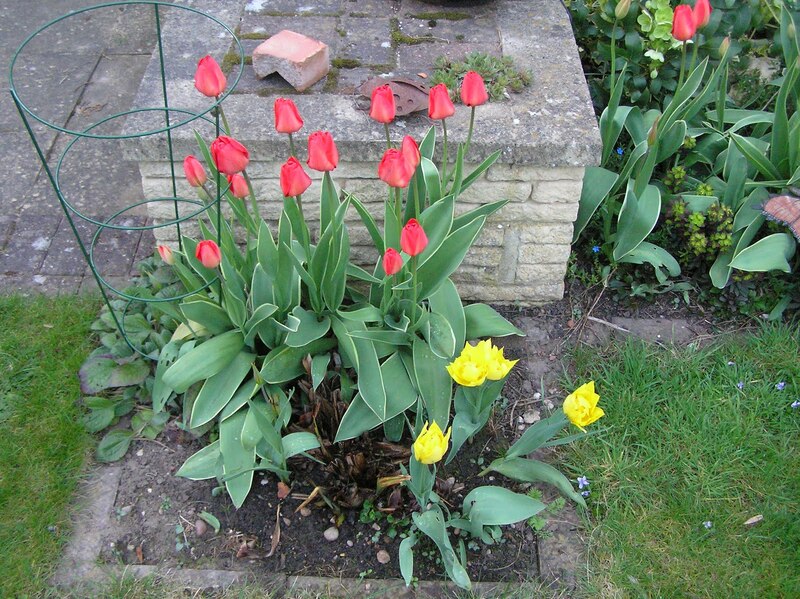 well, a bit of tidying up in the garden, which is currently looking absolutely lovely, I must say. Went out to lunch with Mother for her birthday and had a lovely meal at the Ewe and Lamb in Bromsgrove. Popped round to YD to have a look at the various paint samples on their newly plastered walls. A lot of sleeping. A lot. 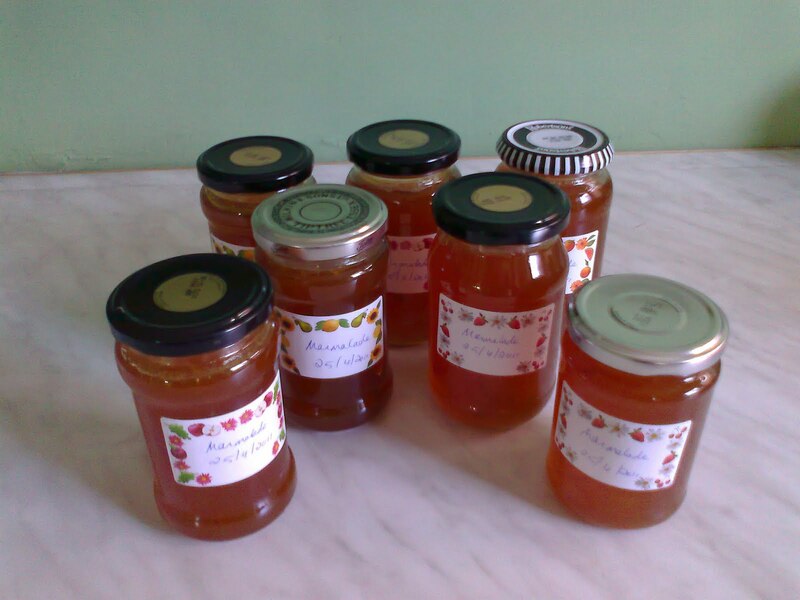 On Monday I made some marmalade. From a tin, a sort of kit thing, called MaMade. Haven’t actually eaten any yet, except the little tiny bit which you have to check for “setting” properties, and that was nice. Impressed? you should be. Next project is jam, when there’s some nice fruit in season and I have saved enough jam jars. Yesterday went round to YD’s chappie’s sister Louise and had a lovely lunch with her and her two delightful children, Z, who is 3, and A, who is 1. Z is a live wire, and full of fun. Most disappointed that I’m not a “pink” type gal – “oh please may you like pink!” so I allowed that it was nice on other people, but I am really not a pink or fluffy type person. Then we played in the sandpit, then a second cup of tea. “A” really liked “this is the way the ladies ride” bouncing on my knee, as have all five of the grandchildren . . . and he laughed! which was lovely as he’s not been too well. Erm, then I posted back my Actiwatch – by Special Delivery – (for monitoring my sleep activity, of course ! why else would you bother with the dratted thing? ), Boots for some new face moisturiser (same as the old one which had run out, not a different sort), then Halfords for a new interior mirror for my car. Then home for a sleep . . . .
Ha. Well, the mirror thing was a disaster. It stuck to the windscreen ok but was at completely the wrong angle for me to see anything in it! Took it back this morning, got a refund, and got the helpful chappie who sits under a canopy advertising windscreen chip fixes to do it. Currently it’s attached to the windscreen, but I daren’t adjust it yet. Tomorrow I think. Now I’m absolutely done in and can’t wait for lunch and a sleep . . . must pot up the sunflower seedlings, which are going bonkers in their little pots. Roots coming out of the bottom and everything. 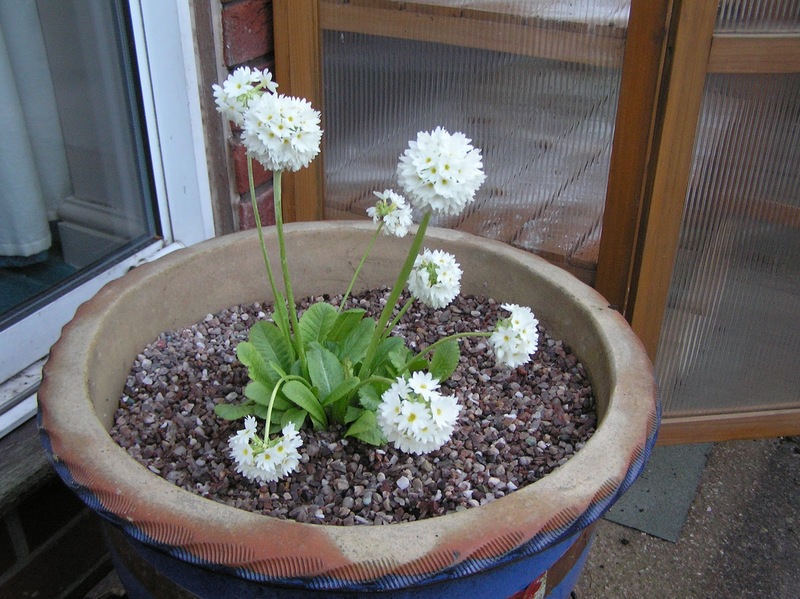 They will look a little odd in the huge pots I have designated for them, but they’ll soon grow, as long as the slugs/snails don’t get them . . .
It’s been a while since I posted, I know, but Things have been Occurring. I had my hair cut on the 15th, went to see the asthma nurse on Monday 18th, had a pedicure on Tuesday 19th, and went round to my friend Cas to set her up with her iPod on Wednesday. Tuesday night Bertie The Cat didn’t come in after her tea. 10.30 pm and still no cat. I went off to bed but couldn’t sleep. Then at 3.30 am I heard a cat fight, a really loud one, so went downstairs and opened the patio door, rattling the treats. She was there, but not sure about whether to leave her assailant or come in. After a minute or so she did come in, tail absolutely huge, walloped down her food at speed, had a large cuddle and purred a lot, and just when I’d got back in to bed, she hoiked up the food. Very neatly and quietly though. So I got out of bed again, cleaned it up, and eventually got to sleep about 4.30. Strict curfew now imposed. I let her come round with me watering the pots (me not her), then she has tea about 6 pm, which she woofs down, and then she’s in for the night. We’ve always kept her in at night, but now it’s so much warmer she’s loving it. But I think it gave her a bit of a fright, the cat or cats unknown who attacked, because she’s very reluctant to leave our garden now. Bless. My friend Rejane phoned today. I’d left a message last night on her phone, and wasn’t sure whether they just didn’t want to talk to anybody, or were away, or what. I’ve sent her birthday present off anyway (next Friday). She phoned me back today and we had a long chat. She’s a bit tearful some of the time, but who wouldn’t be. She and her husband are just such a lovely couple and it’s such a dreadful thing to happen to anybody (see previous post of 29th March). The grandson sounds absolutely delightful, but saying some heart-rending stuff. “Is Mummy coming back on Sunday for something to eat? Well, can she come another day then?” Oh god oh god oh god. Bless his little heart. Fortunately the son-in-law and grandson live close by, so that Rejane and her husband can see a lot of them, and they can help each other. I wish I lived closer then I could just pop in. 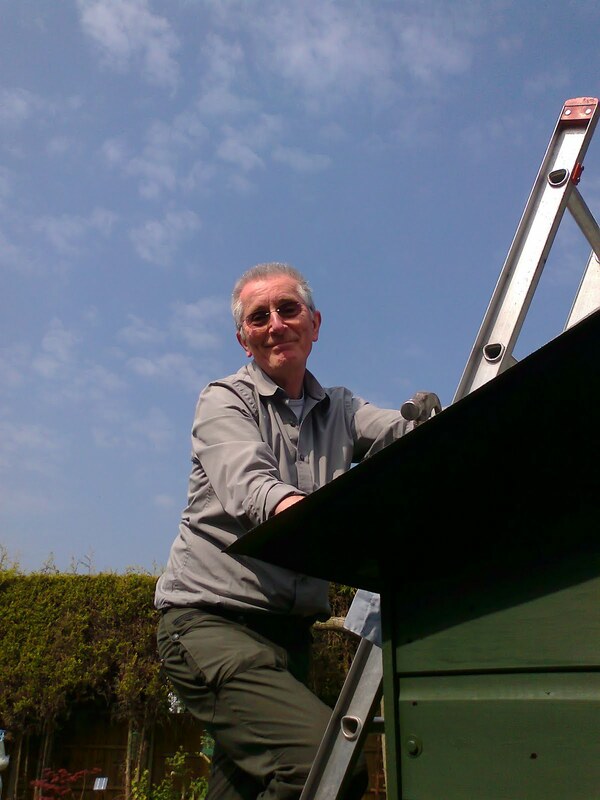 Today Vic decided to re-roof the shed with roofing felt, so while he was doing that, I painted the edging boards. It’s all very satisfying. Then I cleaned two bathrooms. Not as thoroughly as I would have liked, but I only have so much energy. I’d just finished cleaning the bathrooms, and was literally getting into the shower, when I heard a little “Hello? 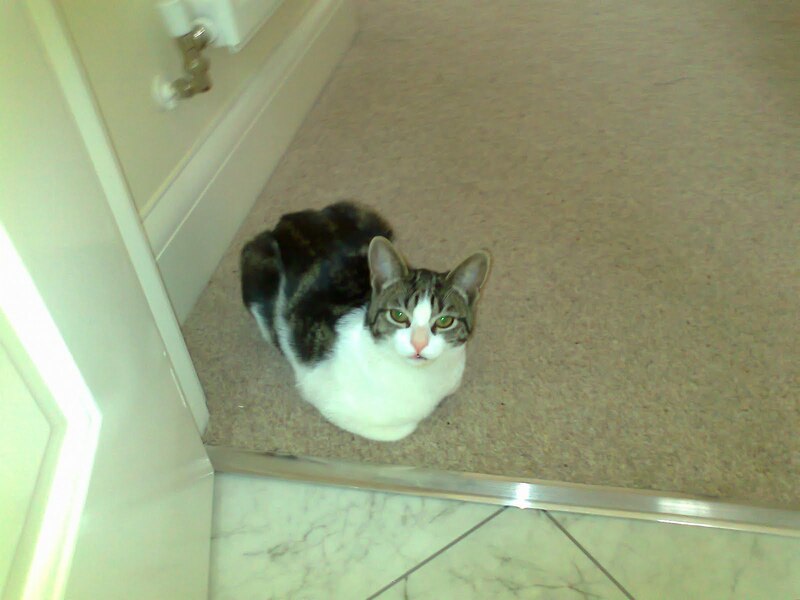 Hello?”, wrapped my mercifully large towel round me, went downstairs, opened the front door, and the porch door was open. Hmm. So I said Hello, as well, and YD appeared. Lovely. Cups of tea were made (while I was in the shower) and drunk, chats were had, all very nice. Next, lunchtime. Goat cheese and tomato sandwich, then banana, then two little “free from” chocolate cakes. Am on a diet (despite above!) trying to lose 7 lbs. Am currently winning, have lost 5 lbs so far. Next project: Tai Chi. They do a class locally, so next Friday,29th (and b*gger the Royal Flipping Wedding), I’m going to go. Assuming of course it’s open, as it’s a Bank Holiday. For goodness’ sake. Why on earth don’t we have a Republic? Also have resolved to use the Wii Fit+ more often. I did try a ten minute walk round the block five days a week, but that did my knee in. Ah well. Tomorrow lunch with my mother, it’s her 79th birthday. Remarkable woman. Twice the energy I have! Just back from spending two days with my friend Deb (we went to secondary school together, and have been friends for 45 years!) She moved to Tewkesbury last year and lives in a lovely house, in a lovely area, with her wonderful family, and it was just great. I caught the train down, and Deb brought me back. It would be so much easier if I could drive there and back, but I’m really not able to drive for more than about 20 minutes, and it’s a 3/4 hour journey. Yesterday we pottered about drinking tea and chatting, as you do, went up to their “caravan” which is really like a small bungalow, all mod cons, “wintered” and fabulous. Walked her dog Mollie, played with the kitten Maisie (who is completely bonkers, feisty and adorable), and then pottered around Tewkesbury today. Waiting while I put on my make up! I slept like a log while I was there, even in a strange bed. Missed the granddaughter, who is going there today, which was a shame. Maybe next time. Hubby is currently cooking dinner, I’ve just sorted out the online shop which will be delivered on Friday (checked the quantities very carefully after the last fiasco) and we’ll go through it together later for the final edit. 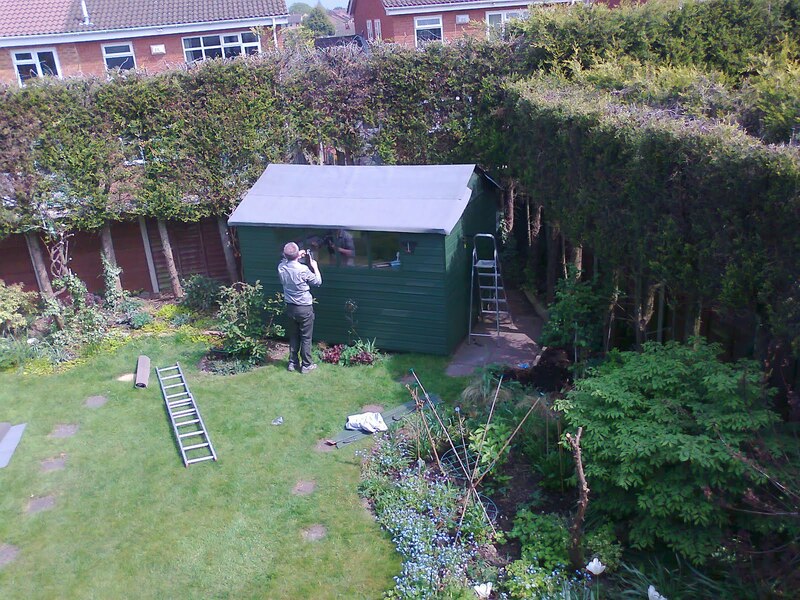 Here is a picture of the painted shed – I’m very smug about it – took us an hour and a half between us. Well. Went to the Queen Elizabeth Hospital today. We allowed 1 1/2 hours for the journey, which turned out to be about right. It’s a 30 minute journey to the actual hospital, 15 minutes faffing about finding somewhere to park, another 15 minutes faffing about trying to find out where the shuttle/courtesy bus drops off/picks up, and when we couldn’t, another 10 minutes deciding what to do about it. Very stiff letter to be composed and sent regarding this particular little annoyance. And when we actually got to the actual building with the actual clinic I needed, we sat in reception for five minutes and a woman appeared with an envelope which she handed to me. Inside was a watch-sized contraption to wear on my wrist, and a couple of sheets of instructions. “Could this not have been posted to me?” I asked (fairly amicably, considering my fraught state of mind). “Well, we tried that, but they kept getting lost in the post, and they’re £1,500 each.” Fair enough, say I, but they agreed I could post the thing back to them. Registered post – oh I mean Special Delivery – of course. Much cheaper and less bothersome than the journey, parking, etc etc etc. Tomorrow is shed-painting day. 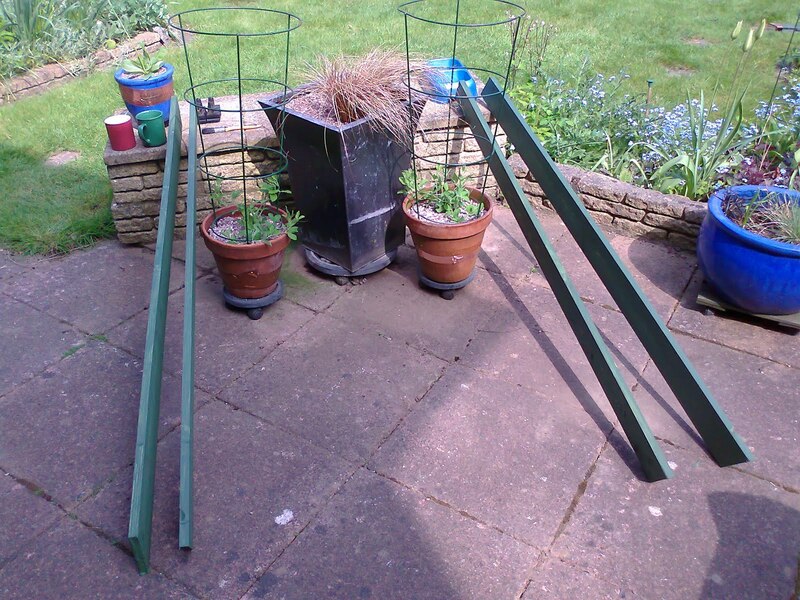 It needs to be done now, before the foliage gets too dense in front of it, or left until September/October, when it could well be too cold and miserable to do it. So tomorrow it is. 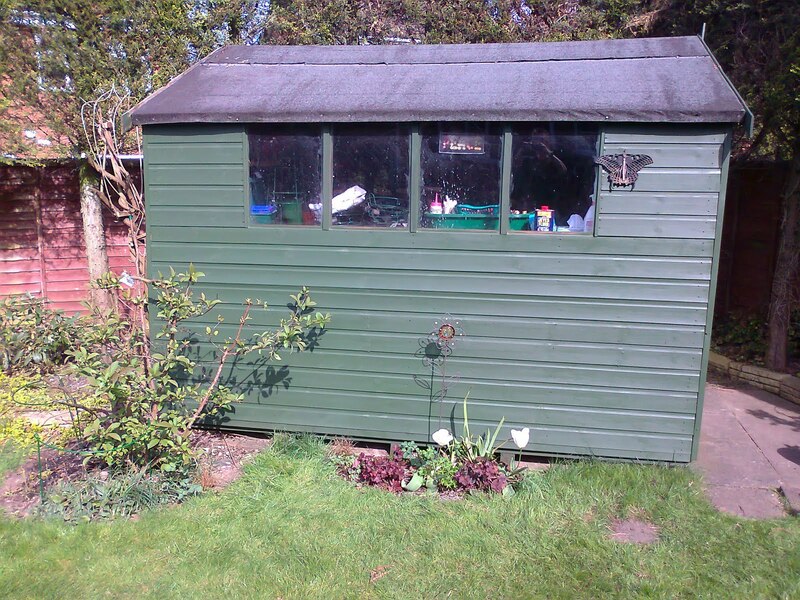 Have bought some new shed paint because we’ve used all the old stuff (Cuprinol Duck’s Back, Forest Green). 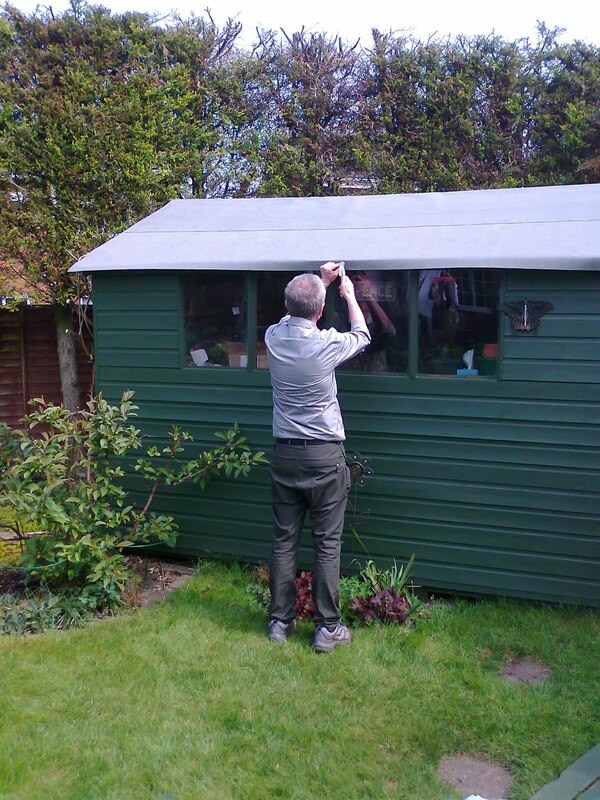 We have done it twice before, because when the shed arrived it was a ghastly orange colour, as the wood was so new. The green makes it blend into the background and complements the garden much better. So I’m expecting one coat will do it. And that hubby will help me . 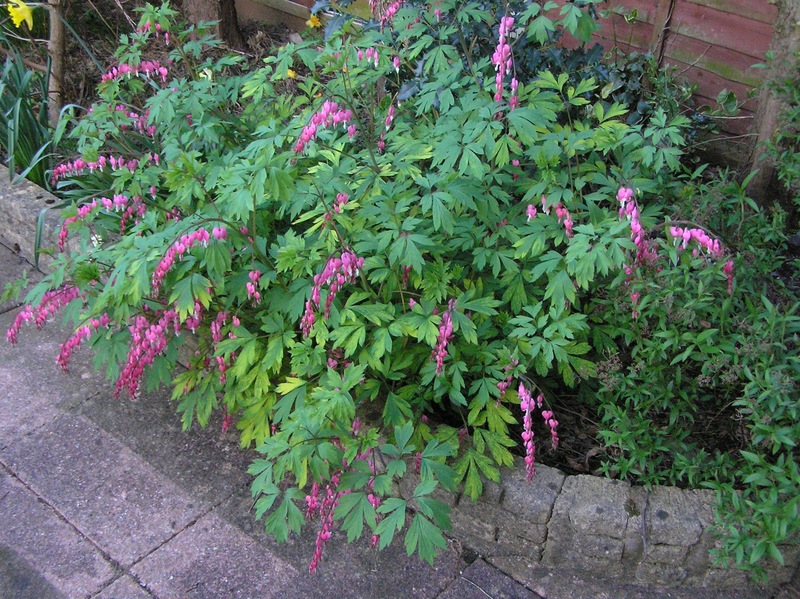 . . . .
And here are some pictures of the garden, as promised. The tulips are closed because it’s evening time, but they open during the day. Who knew? I suppose I should have mentioned Mother’s Day – which was Sunday 3rd. It was lovely. ED came up on Friday with chappie, spent Friday night and Saturday morning with us, and had some flowers delivered, which were lovely. YD was away for the weekend but brought me a lovely card before she went, and phoned me on the day. I phoned my mother also (what goes around comes around!). Tuesday went to the osteopath. Today saw the physio, who provided me with a thumb splint for my left hand and has referred me on to a consultant (surgeon) because she thinks it’s carpal tunnel syndrome and will need releasing surgically. Ho hum. 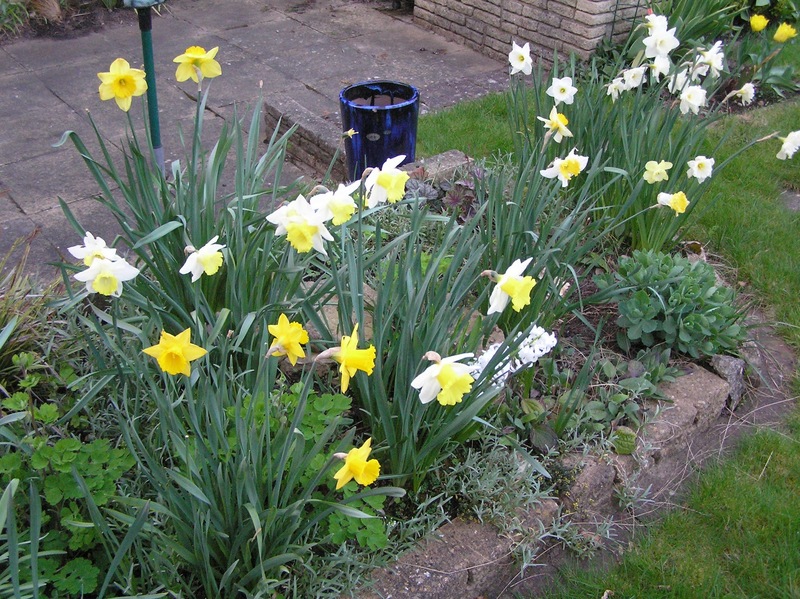 Tomorrow am intending to plant some crocosmia corms to replace the pennisetums which died, and maybe weed the front garden. Every day involves at least a 3 hour sleep in the afternoon, unless I’ve stayed asleep until noon, which is what happens unless I set the alarm. Tomorrow I will set the alarm, because otherwise I won’t get any gardening done. Then I’ll shower and dress, then bed after lunch. Friday will involve a visit to the QE hospital to have a monitor fitted so that they can hopefully work out why I twitch so much in my sleep. Another delightful feature of my life . . . .
Must go, it’s half time during the Manchester United – Chelsea match and I think it’s Champions League or something. Love the football, can’t get my head round the different Leagues. I know when it’s the World Cup but that’s about all. Well, life goes on much the same here. I’ve been able to get in the garden and sort things out a bit. I’m not quite sure that the phormiums have all died, I’ll see how they go by the end of another three weeks or so. But have definitely lost a hydrangea, all the ferns, the perennial bright red lobelia, possibly both the clematis passifloras and probably the buddleia. The poppies had all huddled together (for warmth?) almost on top of the sea hollies, so I had to dig them up and sort them out. The bronze grasses were much too big for their boots, so I divided all three of them into ten smaller ones, and they look much better. 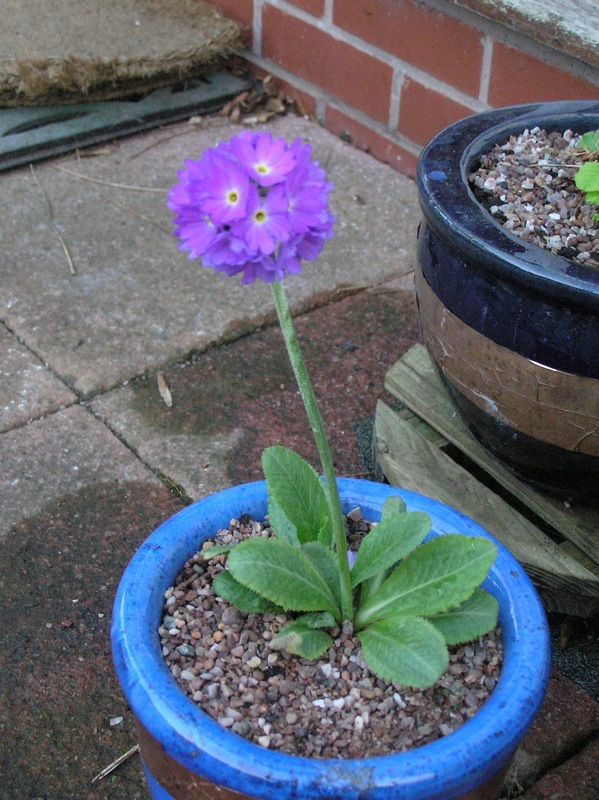 I’ve replanted several pots which also look much happier now. It was a very hard winter, so it’s not surprising, and most of the plants which have died I will replace with something different, but the buddleia I will simply buy another one. Also I fancy some euonymus for the difficult bed at the back of the garden – evergreen ones I think, two or three different ones. There is a viburnum (at least I think that’s what it is) doing well in there, and a hardy geranium and a sedum, but that’s all, and it looks a bit bare. Today I went to John Lewis and returned some combat trousers I didn’t like, got hubby some new socks and spent a princely £9 in Gap on two tops. Yes, two. Amazing. Then spent £80 on line with Lands End, but if I don’t like the stuff it will go straight back. I’ve ordered two pairs of combat trousers and three cotton jersey cardigans for the spring/summer so we’ll see. When the garden looks a bit better I’ll upload some photos I think. Tomorrow – osteopath. Wednesday – physio. Friday – Q.E. (for the M.E.) Busy busy busy.